The photos are beautiful and I enjoy Kevin's comments. 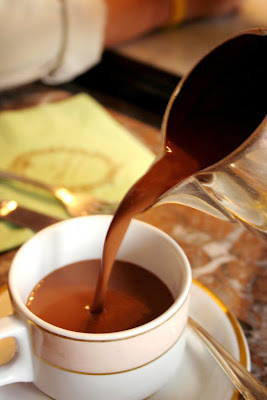 I was thinking that the caption "Hot Chocolate...at Laduree, Paris" illustrates the contrast between the simple and exotic nature of chocolate perfectly. This photo clearly isn't a Nestle commercial. Pouring a traditional winter staple like hot chocolate from an elegant silver server into a Limoges cup ringed with gold evokes a sense of warmth and elegance. And isn't that perfectly chocolate? The best cup I've had was at a little cafe in Mougin. Was curious what they'd done differently. It was like drinking chocolate silk. ummmm...just seeing the picture makes my mouth water. I agree with one of the other comments that the image evokes a certain warmth. However, I have to close my eyes when I drink mine and pretend that I'm at Laduree (not sure how to do the accent mark in this comment box) since I'm in the 65-degree weather of Texas, pouring the grainy cocoa mix from a paper package into tepid tap water while sitting in front of my computer in a rather cluttered cubicle. One can dream though! Oh! If only we had it here in Manhattan. Did you take that picture? That hot chocolate looks amazing! No, I didn't. But this gives me a good excuse to go to Ladureé to take some pics! la dolce vita, Haute & Sweet is a celebration of our shared passion for great chocolates, shopping, and travel.